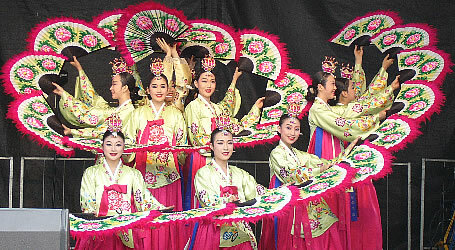 From kiteboarding and jet skiing to high-speed boat rides, aquatic leisure activities abound in Busan, the nation's second-largest city that is well-known for its beautiful beaches, exciting nightlife, summer holiday vibe and succulent seafood. Numerous seaside activities are also available at neighboring coastal cities in the south. Gwangalli Beach in Busan offers great night views created by a cluster of skyscrapers and an illuminated Gwangan Bridge. By day, visitors can soak up the sun and enjoy diverse marine sports. A motor boat pulls a banana-shaped boat past Gwangan Bridge. Various boat rides are on offer, from regular motor boats to those shaped like bananas. The latter are pulled by speed boats and see riders dunked in the water as the boat makes sharp turns. Others shaped like red sharks offer a drier ride and make several rounds before returning to the beach via the bridge. Rides cost between W15,000 and W20,000, but discount packages are also available (US$1=W1,123). Left: A father and son learn how to surf. Right: A couple enjoys some time kayaking. Dadaepo Beach in the western part of the city is known for its beautiful sunsets, which have attracted numerous TV and film production crews. But recently it has become more famous as a kiteboarding spot. 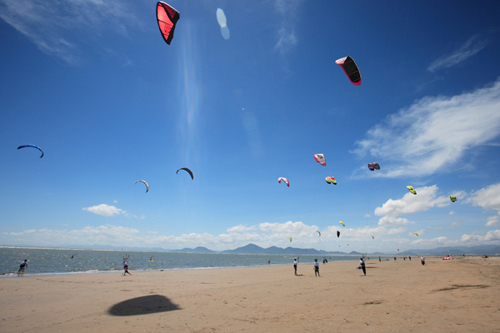 Kiteboarders make for scenic views at Dadaepo Beach. With its shallow waters, small waves and plenty of wind, it serves as a perfect spot for this extreme sport, which harnesses the power of the wind using a large controllable kite to be propelled across the water. The area is so popular on windy days that the sky becomes a palette of colorful power kites. 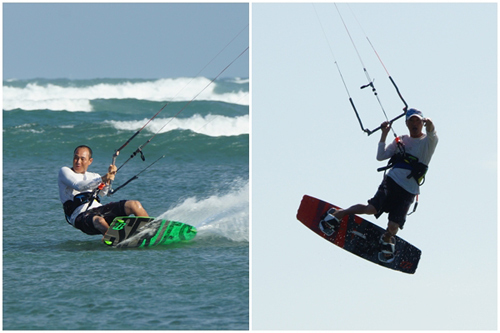 Kiteboarding takes in both the sea and the sky. 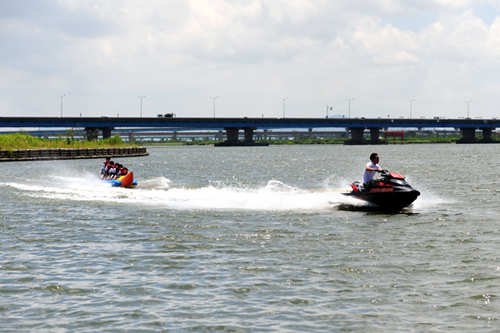 Nakdong River is emerging as a hot spot for water sports activities. 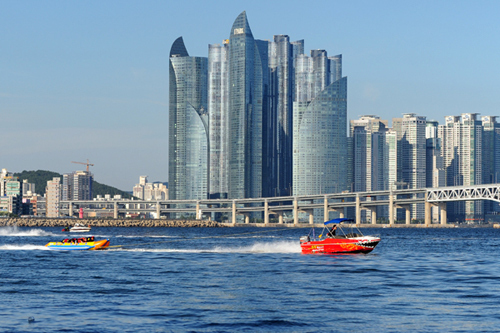 A sports center in Hwamyeong-dong, in the city’s northern area, offers a range of marine adventures such as banana- or peanut-shaped boat rides or wakeboarding. 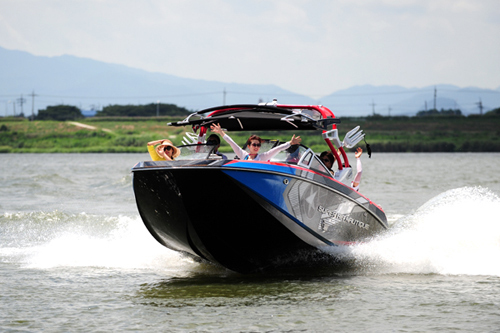 Wakeboarding boats were recently made available and have become hugely popular. The boats can take up to 16 passengers and water is pumped into and out of ballast tanks from the surrounding water, adding more fun to the rides. People enjoy a banana boat ride on the Nakdong River. 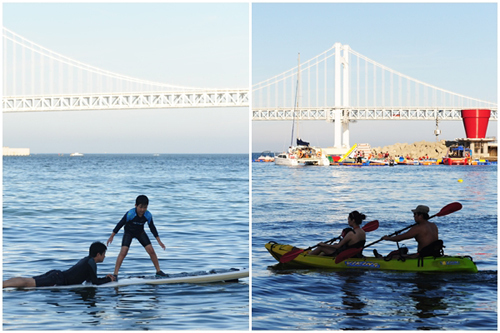 Jinha Beach in the neighboring city of Ulsan is also a good place to enjoy water sports. From May to November, a range of marine activities are available from windsurfing to speedboating and riding on dinghies. Visitors also can use facilities at the beach for free. For the last few years, international beach volleyball and yacht competitions have been taking place every summer. A marine sports center will be built here next year. People enjoy a wakeboarding boat ride. Also close to Busan, Deokpo Beach in Geoje, South Gyeongsang Province is recommended for those with an adventurous spirit. Visitors can enjoy zip-lining over the sea, with the rides beginning from a 17-m high tower. The zip line consists of a 400-m cable stretched between points of different elevation, a pulley, and a harness or bar for attaching a rider. It offers refreshing views of the sea and draws over 500 visitors on weekends.